Colin Youngson was a familiar part of the running scene in Edinburgh in the 1970’s and knew all the runners, their strengths and weaknesses and got on well with all of them. He has written three sets of brief profiles of many of the runners from the top clubs and they should maybe read together. The others are of course Edinburgh Southern and Edinburgh University. “Edinburgh Athletic Club’s Fast Pack features: The Knowles twins (Danny and Ronnie) and Dougie Hunter. Others who contributed are Phil Hay, John Kerr, Eric Fisher, Davie Watson, Robin Morris, Nigel Jones, Colin Keir, Alan Gourlay, Archie Jenkins, Brian Kirkwood, Ken Mortimer and that very good Anglo, Joe Patton. Danny and Ronnie Knowles really have to be profiled together. Onlookers could only marvel about how similar and how young and fast they seemed in November 1972 when they first ran in the Edinburgh to Glasgow Relay, running the final two stages with their team finishing fifth. They were newly 18 years of age. In 1973 Danny had to fight the class men on Stage Two, and on the last Ronnie overtook the Aberdeen runner to secure a silver team medal. EAC never managed to win the E-G but came second six times out of seven! Both Danny and Ronnie won three silvers, and Danny was fastest on Stage Seven in both 1975 and 1976 while Ronnie was fastest on Stage Eight in 1976. In the Scottish Junior Cross-Country in 1974, Ronnie finished seventh and his twin tenth, while EAC won bronze medals. Their best Senior National was in 1977 when they obtained team bronze. The Scottish Cross-Country Relay produced two bronze and two silver medals for Danny and one silver for Ronnie, who won another silver medal in the 1981 Six Stage Road Relay. The above worthy performances were definitely over-distance work for the twins, whose best distance was actually 1500m. Danny’s fastest time was 3:46.5 and he won an individual silver medal in the 1977 SAAA Championships, plus a bronze medal in the 1976 indoor event. Ronnie produced personal bests of 3:48.2 (1500m) and 8:29.81 (3000m). He won a bronze medal in the 1974 Scottish indoor. Dougie Hunter was a tough, stocky guy who always battled as hard as possible. One of his finest moments in the sport happened early: in the 1978 Scottish Junior Cross-Country, he claimed a valiant second place despite being a full minute behind the peerless Nat Muir. Dougie must Have enjoyed leading EAC to a gold medal by means of a crushing victory (29 points) over Glasgow University (93) and Nat’s club Shettleston Harriers (107). To that I’d like to add the name of Ken Mortimer. When I was organising the British Milers Club races in Scotland in the mid eighties, Kenny was an almost ever present with his clubmate Nigel Jones. Both were accomplished track runners. 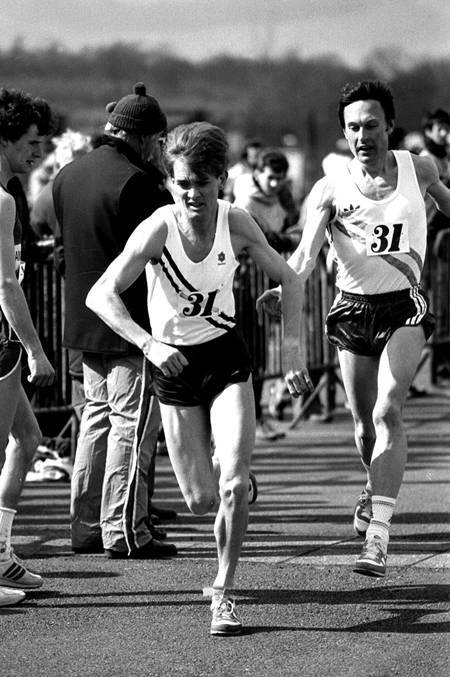 Ken however seldom ran on the country although between 1982 and 1987 he ran in five Edinburgh to Glasgow Relays and picked up two silver medals – in 1982 he was fastest man on the fourth stage. His list of personal best times on the track is impressive: 800m – 1:52.8; 1000m – 2:27.42; 1500m – 3:47.95; 2000m – 5:20.2; 3000m – 8:16.68; 5000m – 14:44.1 and he even had a go at the steeplechase with a time of 9:32.28. In 1984 he was third in the SAAA 1500m. He became a veteran in 2000 and has recorded several good times as such. As a V50 in 2011 he ran 800m in 2:19.36, in 2012 he ran 1500m in 4:55.24; he has an 18:00 5K, a 30:06 five miles, a 37:04 10K, a 62:27 ten miles, an 85:06 half marathon and finally a 3:12:29 marathon – all as a V50! After writing the above, contact was established with Ken and he added to the information above. Since it illustrates the period of the 1980’s in Scottish Athletics and the attitudes of the runners so well, I’ll simply quote his email as I received it. It reads as follows. “I remember well the BMC races and never felt that I really managed to do myself justice in them but it was great to have races of that calibre on the doorstep, although at that stage the British League races I was turning out in for EAC were probably taking up the bulk of my mental energy. It was a great time and I had some great fun with running and many of the highlights you covered prompted some further reminiscing on my part. A couple which might be of interest were my first Scottish vest in 1984 over the mile at Alexander Stadium when I was paired to run with that very good anglo, Stuart Paton. I surpassed expectations – perhaps even my own included – in finishing third behind Alan Salter and Eddy Stevens of Belgium in 4:04.32. They’d both run 4:01 but I’d been there till the last 100m. Alastair Currie had unofficially timed me around 3:45/3:46 at 1500 metres during the race. I was flying and was convinced if I could get another mile race a sub-4 was on the cards. That impression was reinforced in early September at a blustery and cold Meadowbank when I ran my quickest official 1500m but by September the races had dried up and plans to go to Cyprus for a late season attempt fell through. Another highlight from those days was the Scottish indoors 1500m in 1987 when the Indoor Championships were revived. I had some experience of running indoors and had been a Cosford Games finalist over 1500m five years earlier but this was a championship. Heats were required and I front-ran my heat and came under pressure but was determined not to give way, holding on to win it but racing harder than I needed to. Graham Crawford of Springburn who ran 3000m that day, telling me what I already knew, that it would have been more sensible to ease off since I was in a qualifying position anyway. Alan Smith of ESH who had a recent 3:46 under his belt was the big threat from the other heat but when the final was run a couple of hours late, to my delight I kicked harder than he did (off a slower pace than the heat) to win it. I went on to have a decent indoor record winning the East 1500m title the following year (1988), and then picking up two Scottish bronzes over 3000m in 1990 and 1992. I also ran a bit quicker at two of the distances, 5000m and 3000m steeplechase, both in 1986. In a Scottish League match at Meadowbank having travelled up from a GRE Cup match 1500m in Wigan the day before, I ran 14:33.47. It’s a time I should have bettered a few years later in 1992, the year I won the 5000m at the East Districts, but didn’t. A week later, this time in a British League match at Meadowbank, I lowered my steeplechase time to 9:16.03. Since the site is mainly about road running, maybe I should also mention two of my better road races. The first was the 1983 6 stage relay on leg 5 when I attacked the short leg hard to put EAC back into contention (and back into the lead) with a run which set up a last leg showdown between Lindsay Robertson and Allister Hutton for the title. Allister was imperious that day and brought Southern home and the EAC squad had to make do with silver medals. Then there was my occasional venture up into the world of the 10 mile races. Having been an organiser of the EU 10 mile race in 1982, I finished up eighth in 51:43. This coincided nicely with my best for 400 metres at the time, 51.4. I ran it (ten miles) again in 1986 when I finished fifth in 52:40 (and there are some hotos of the race in Graham MacIndoe’s collection) but by now I was intrigued to see what I could do over an easier course. I got the chance in 1990 when I ran the Tom Scott and finished tenth in 49:08. And that’s it in his own words. It is included for several reasons: first it just radiates the tremendous pleasure he got from his running and he doesn’t list numbers of medals or list all his best times he just speaks of the great memories he has – and what’s the sport for if not for the memories. All coaches are giving their charges memories and if they look back on their career with the delight that Ken does, they will not have done a bad job; second the desire to improve – and the regret when he didn’t -is mentioned at several points, eg aiming to travel halfway across the world to Cyprus to get a better time, or regretting not bettering his 5000m time; third it illustrates the range of events open to runners at the time – Scottish League, British League, Open Gradeds, Championships, Cosford Games and so on. Most are still there but not all are and it is much more difficult to plan a year’s progressive racing now than it was then; fourth, he talks of international representation, the lack of such now is well documented elsewhere on this website.